Merry Christmas, Happy Hanukkah, Happy Holidays! However you celebrate, my it be joyous! I have one last cookie recipe to share, and then I promise it will be my last cookie recipe for awhile. These Sour Cream Sugar Cookies are a bit different than other rolled sugar cookie recipes I have tried. Crispy sugar cookies aren't my favorite so I thought I would give this recipe a try. The instructions said to use a well-floured, cloth-covered surface and covered rolling pin. Even though the dough seemed very sticky, it rolled nicely and I didn't have problems with it sticking. I did make sure to keep my pastry cloth and pin well floured. I tried rolling some of the cookies thinner and others thicker. Whether thick or thin, these cookies stayed soft and tender and tasted very good. I thought the taste was excellent for a rolled sugar cookie, but my kids thought they didn't have much taste. I was in a hurry to get these done so I only decorated them with colored sugar. Next time I will probably use buttercream frosting on the top. I know the kids will like them then. I want to thank Sandra from Sweet Sensations for the Wilton Cookie Cutters and the OXO “Be a Good Cookie” Spatula. I recently won Sandra’s giveaway and enjoyed using my new things to make these cookies. I also thank OXO not only for the cute spatula but for their work with Cookies for Kids' Cancer. Purchase of the spatula helps OXO support Cookies for Kid's Cancer, up to $100,000. At their website you can read more there about OXO’s mission raise money to fight pediatric cancer and find out how you can get involved. You can even send a virtual cookie! Soft and tender rolled sugar cookies. 1. Heat oven to 375°F.2. Mix together the sugar, butter, shortening, vanilla, and egg.3. In a separate bowl, combine the flour, baking powder, baking soda, and salt.4. Gradually alternate adding the dry ingredients and the sour cream to the wet ingredients; stir until combined.5. On a well-floured, cloth-covered surface roll out about a quarter of the dough at a time; roll to desired thickness.6. Use cookie cutters to cut into desired shapes.7. Place about an inch apart on ungreased cookie sheet and sprinkle with sugar, if desired.8. Bake for 6-8 minutes (depending on thickness) or until bottoms are very lightly browned.9. Immediately remove cookies from cookie sheet and allow to cool on a cooling rack. The sour cream sounds like a good addition in a sugar cookie, I like them soft too. The cookie cutters and spatula are so cute! As always, exceptional photography! These are so festive! I have a sour cream coffee cake that I love. I love the texture that it adds to baked goods. These sound perfect! 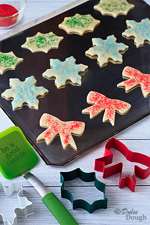 The cookie shapes are perfect, and the colored sugar makes them look so festive! I'm with you, softer sugar cookies are way better than crispy ones! These look perfect! And they hold the shape they were cut into, something that's very important in a sugar cookie :) Merry Christmas! I love the spatula. At first I thought you might have just used the magic of technology to have it say that. Too cute! I've never been a fan of sugar cookies--but with your addition of sour cream, my curiosity is piqued! The recipe is straight forward and easy looking. Even I could make them! Sugar cookies are all I can think about at Christmas time. These one look and sound fabulous! These are so cute! I love how sugar cookies can be personalized to the baker's taste, and yours are lovely! I am sure they are just as delicious as they appear as well! Hope you are having a wonderful Holiday weekend :)! I love how pretty these are with the glittery sugar on them - really lovely and Christmassy. wow..the sugar cookies look so delicious...loved ur clicks :-) wishing u n ur family merry christmas ! I have tried a couple of cookie recipes calling for sour cream, even have some dough chilling now in the fridge, and loved all of them. Saving this recipe too. Thanks Jill! Jill...these are beautiful cookies and I do prefer my sugar cookies to be chewy rather than crunchy, too! So glad you won Sandra's give away. I think you are both wonderful people and I just wanted to stop by to wish you and yours a fabulous holiday season! Bookmarked to save the cookies recipe. Love it! 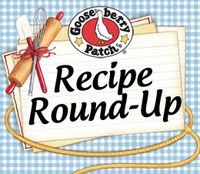 Any recipe with butter, shortening, and sour cream in the dough sounds to me a "good old fashioned" tried and true recipe! The shapes are so pretty, and festive, as well! Hope you had a wonderful Hanukkah/Christmas, Jill, as did we. We celebrated both in our family! As overdosed as I am on cookies right now, yours make me want to bake some more. Your pictures are so gorgeous, Happy New Year! I am so behind in comments. I do hope you had a wonderful Vhristmas and a very happy New Year. You will be my new source of recipes to follow for my baking experiments.